Explore Restorative Yoga beyond the basics! 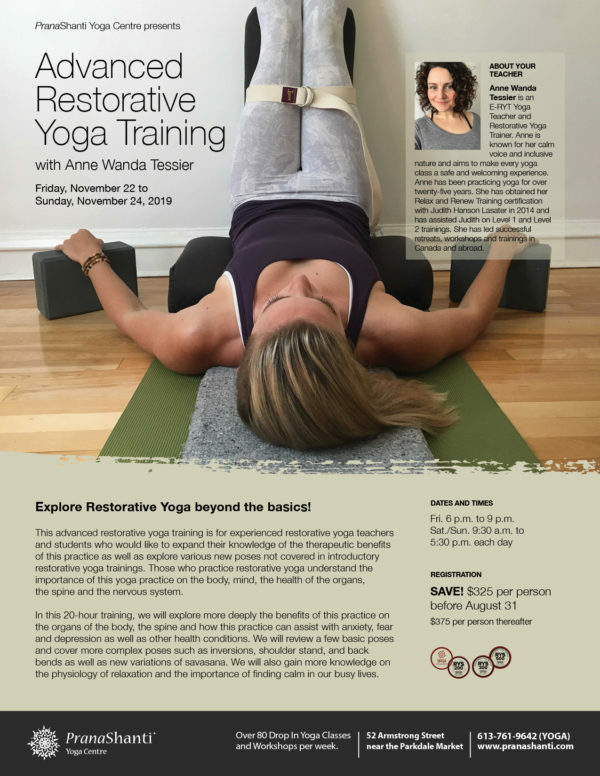 This advanced restorative yoga training is for experienced restorative yoga teachers and students who would like to expand their knowledge of the therapeutic benefits of this practice as well as explore various new poses not covered in introductory restorative yoga trainings. Those who practice restorative yoga understand the importance of this yoga practice on the body, mind, the health of the organs, the spine and the nervous system. In this 20-hour training, we will explore more deeply the benefits of this practice on the organs of the body, the spine and how this practice can assist with anxiety, fear and depression as well as other health conditions. We will review a few basic poses and cover more complex poses such as inversions, shoulder stand, and back bends as well as new variations of savasana. We will also gain more knowledge on the physiology of relaxation and the importance of finding calm in our busy lives. Students will have the opportunity to practice poses and explore how to use props to fully support the body (including variations depending on health conditions) and leave the training with new many new poses to explore in their personal practice, in group classes as well as with individual students. Friday, November 22 to Sunday, November 24, 2019. Sunday: 9:30 am to 5:30 pm. Scheduled periodic breaks will be provided. SAVE! $325.00 per person before August 31, 2019, $375.00 per person thereafter. Includes a 3-hour pre-reading assignment. Please bring the following props with you: 1 bolster, 2 blocks, 2 blankets and an eye pillow. This course is recommended for Yoga Teachers with a minimum of 1 year teaching experience with a basic understanding and practice of restorative yoga. For 200 hour certified Yoga Teachers the credits for this training are eligible for CEUs with Yoga Alliance. This course is also part of our Yoga Alliance 300 Hour Hatha Yoga Teacher Training. Anne Wanda Tessier is an E-RYT Yoga Teacher and Restorative Yoga Trainer. Anne is an experienced Yoga teacher, and Restorative Yoga Teacher trainer. 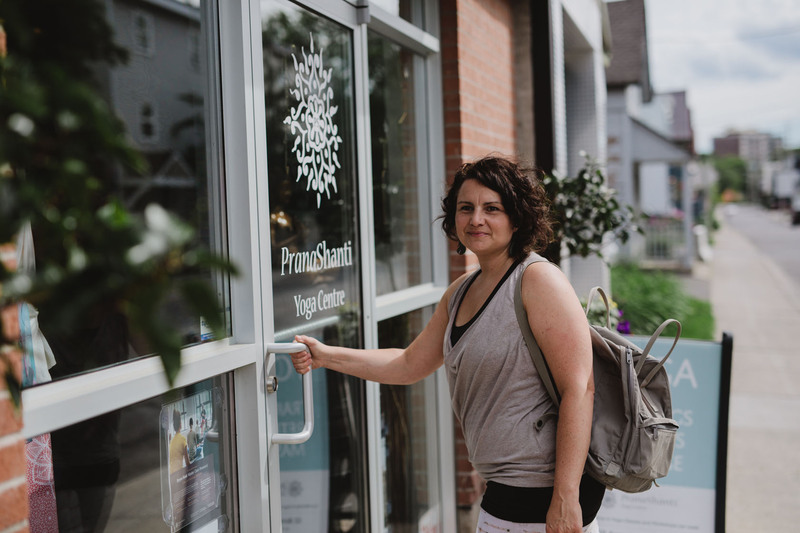 After years of yoga practice and experience teaching various styles of yoga, she was drawn to restorative yoga as a way to balance out her busy lifestyle. Having experienced the impact of stress on her body, Anne is now committed to sharing the benefits of finding calm on the body, mind and soul. 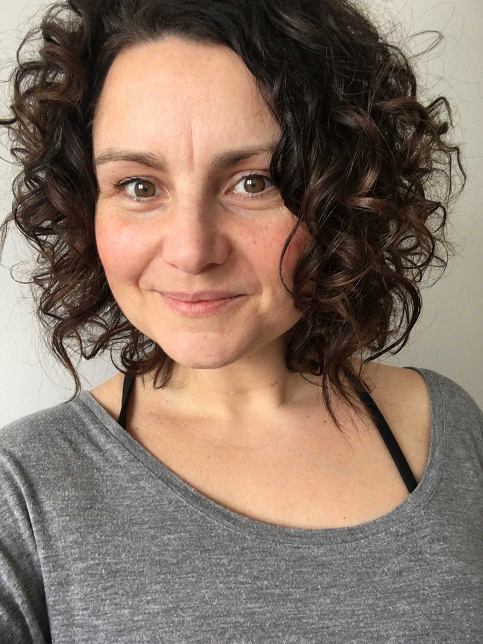 Anne is known for her calm voice and inclusive nature and aims to make every yoga class a safe and welcoming experience. Anne has been practicing yoga for over twenty-five years and obtained her RYT 200 in Bali, Indonesia in 2013. She has obtained her Relax and Renew Training certification with Judith Hanson Lasater in 2014 and has assisted Judith on Level 1 and Level 2 trainings. She has led successful retreats, workshops and trainings in Canada and abroad.